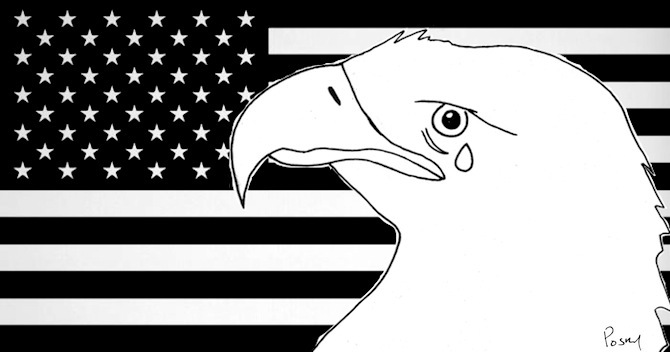 Laying Witness to Great Deeds: Destiny in Aisle Ten | You Monsters Are People. 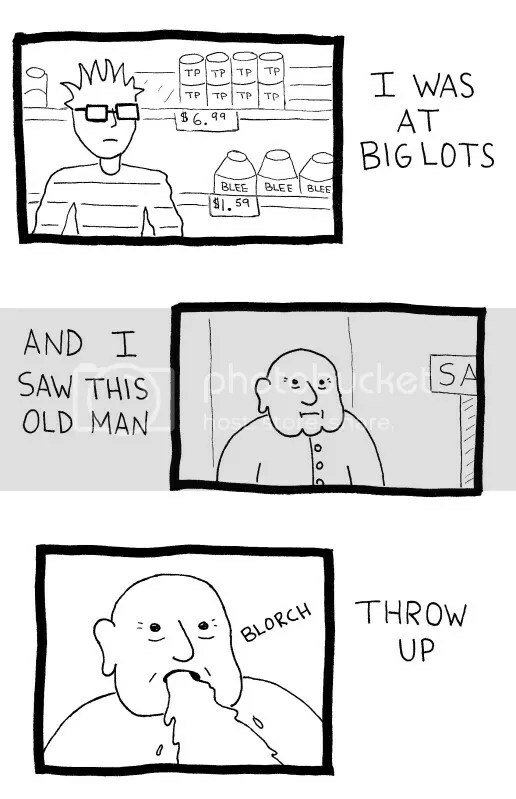 This entry was posted in comics, humor, Life, true stories, Webcomics and tagged big lots, life, matt posky, old people, shopping, sick, true stories, true story, vomit, weird, weirdness. Bookmark the permalink. Did you view it as just another magical mess pouring forth before you? Hmmph . . .
Reason #317 to NOT shop at the Holly Daze ~ Old Men tossing cookies on Aisle 10. My internet had a small fit and then went out for a whole week. Even though it’s entirely groundless, I’m going to blame you original comment. That is truly disgusting. Maybe he thought the store was Big Slop. Maybe he didn’t even realize he was in a store or on this planet. I’m not really sure how much credit I can give his mind. However, if he’s just throwing up in public and walking away nonchalantly it has to be much more or much less than average. Or Big Plops. He probably thinks of himself as a poet leaving little sprinkles of rhyme here and there for the rest of us to aromatize as metaphors for the milieu of the 21st Century’s megatechnopolis. If that is the case, he just became a whole lot more interesting. And I already found him to be an intensely fascinating person. Alright. That’s almost as bad as what people do on public transportation and the walk away like it’s no big, and you are right, sometimes life is kinda magical! Buses and subways are simultaneousness my most and least favorite way to gather interesting experiences. They’re on par with middle-aged and young people. Some are wonderful, some aren’t and there is that rare few that just meant to be witnessed in quiet awe. Especially when one gets the meds just right. I believe that everything hinges on a fine balance. I suppose that even goes for chemical compounds. However, my medicine only includes coffee and the occasional afternoon with alcohol. I believe that too. It IS a fine balance. I think that the old man, who, in your rendering, looks rather Buddha-like, probably had the meds just off a bit. Hence the blorch. Otherwise, just right. Same meds for me too, with green tea and the occasional ibuprofen. Posky, please don’t ever change. u r way to frontal to be wasted at such a young age. luv it. Oh how fantastic and hygienic of him. However , I suppose that if I was sick enough to hurl the contents of my stomach onto the floor at big lots, I wouldn’t particularly want to stick around to let people watch and guess what I had for lunch as I cleaned it up. He didn’t really seem all that sick. When my kids throw ‘up’ tantrums in the toy aisles.. I don’t check out ;) Come on, what is the holiday spirit for?! Forgive and move on!! Well, what else can one expect from a species that pollutes the planet without a thought? Hmm? All kinds of VOMIT everywhere. You just came up with a pretty good advertising campaign against pollution. Good point, Posky—how can we use this to our advantage???? he drank too much milk. Based entirely on color and consistency, milk sounds somewhat plausible. I think there’s the start of an advertising campaign somewhere in this story. As long as they used that old man, bad audio and some really poor quality VHS cameras to film it with, I’d shop there every day and so would all of my friends. Big Lots is the place of epiphanies. Great stuff, really clever. Can’t wait to explore further. I’ve got lots of clever stuff, but I didn’t think this fit the bill. 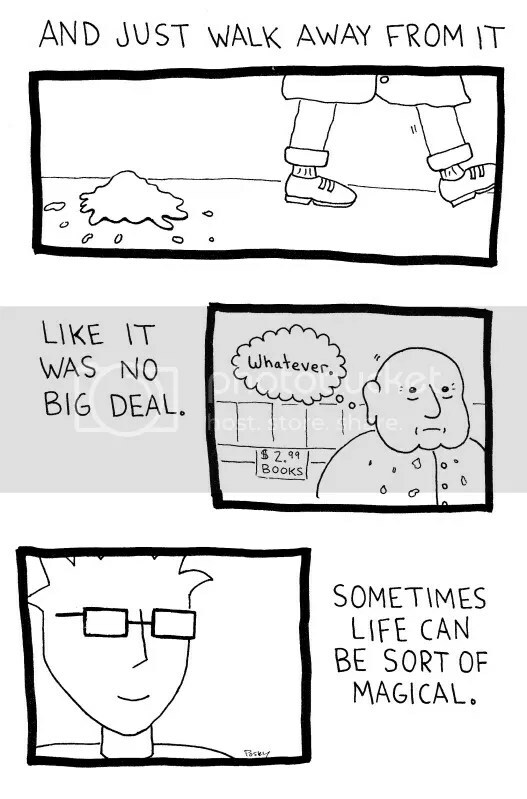 This was just one of those “too amazing not to make a comic about” moments. Ewww. I used to hate going to Big Lots as a child, but I could never remember why. Now I do. Wow. Now that is why video cameras on phones were invented. Sadly, I didn’t have one at the time.